"A purported marketing image of an upcoming Nokia Windows Phone has been published by WMPoweruser, and it could confirm several specs surrounding one of Nokia's first Windows Phone devices." A leaked image of the Nokia 703 is making its way around the internet. The specs on the sheet lists the 703's as having a 3.7-inch 480 x 800-pixel LCD display with a 5MP camera, 8GB of storage and 512MB of RAM. According to the image, the 703 is slated to launch on November 27th. 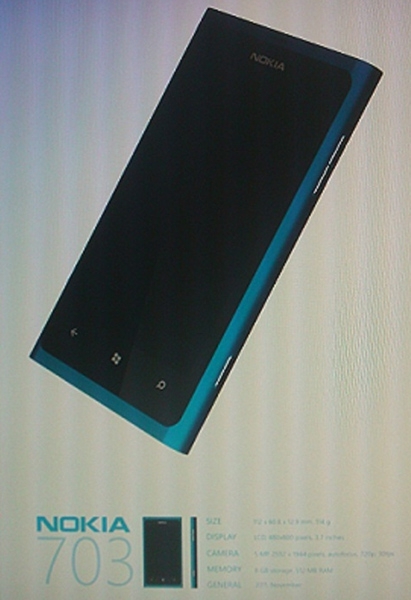 Based on last year spec's for this phone, I would say it is safe to assume First Nokia WP will be a budget device. Wow, what a disappointment. Nokia has released some fantastic hardware running Symbian over the last year, but they chose to go completely low end for their first WP? I don't see the logic. What are they thinking?